Prime Minister ‘Narendra Modi’ has inaugurated the Sikkim's first airport at Pakyong (about 30 km from Gangtok). It will improve connectivity and benefit the people of Sikkim. 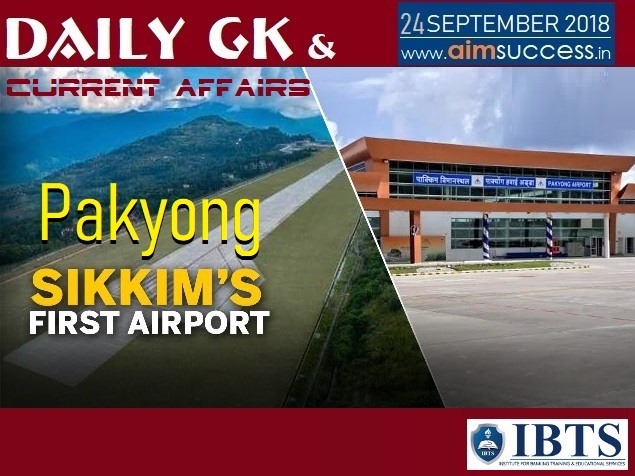 The Pakyong airport is situated at an elevation of 4,500 feet above the sea level, built at a cost of over 600 crore rupees. Commercial flights will begin from 4th October when Spice jet will start its daily Kolkata-Sikkim flights. Under the Civil Aviation Ministry’s Ude Desh Ka Aam Nagrik (UDAN) scheme, SpiceJet will operate 78-seater Bombardier Q400 flights to and from Delhi, Kolkata, and Guwahati every day. Prime Minister Narendra Modi has launched Centre's flagship ‘Ayushman Bharat-National Health Protection Mission (AB-NHPM) from Ranchi, Jharkhand. Under this scheme, over 10 crore families will be provided health assurance worth five lakh rupees each, every year. The scheme will become operational from 25th September on the birth anniversary of Pandit Deendayal Upadhyay. The ambitious Ayushman Bharat scheme, renamed the Pradhan Mantri Jan Arogya Abhiyan (PMJAY) aims to provide coverage of Rs. 5 lakh per family annually. A beneficiary covered under the scheme will be allowed to take cashless benefits from any public/private impanelled hospitals across the country. Today, ESL Narasimhan (Telangana and Andhra Pradesh Governor) has inaugurated the second corridor of the Hyderabad Metro Rail between Ameerpet and LB Nagar (16-km stretch). The 16 kms stretch of Metro Rail has 16 stations. With this, the entire 29 kms long corridor between Miyapur- LB Nagar on the first phase of Metro Rail Project will be operational. With this, Hyderabad Metro has become the second largest Metro Rail Services in the country (after the Delhi Metro). The Commissioner for Metro Rail Safety has issued a safety certificate for passenger train operations on the 16-km stretch after testing. The Hyderabad Metro is a rapid transit system, serving the city of Hyderabad, Telangana, India. The mascot of Hyderabad Metro Rail is ‘Niz’. The Union Minister of State for Parliamentary Affairs Arjun Ram Meghwal has inaugurated the two-day National Orientation workshop on National e-Vidhan Application (NeVA). Mr. Meghwal has also launched the new website of the NeVA and administered the Swachhata Pledge to over 200 delegates. This digital intervention is a big step to increase transparency, accountability and decreases the scope of corruption in the functioning of House. NeVA is a member-centric, decentralized digital application that makes information available on a digital platform about day to day functioning of Legislative Houses. International Day of Sign Languages (IDSL) is celebrated annually across the world on 23rd September every year. The first International Day of Sign languages has been celebrated in 2018 under the theme “With Sign Language, Everyone is Included!”. The choice of 23rd September is the same date that the WFD was established in 1951. Ibrahim Mohamed Solih (Opposition leader) has won the Maldives' presidential election. Mr. Solih has secured 58.3% of the popular vote. The Maldives is a South Asian sovereign state, located in the Indian Ocean, situated in the Arabian Sea. The President of the Maldives is the head of state and government of the Republic of the Maldives, and the commander-in-chief of the Maldives National Defence Force. According to Credit rating agency ‘Fitch’, India's economic growth will accelerate to 7.8% in the current financial year (earlier 7.4 percent). Forecast for the next two fiscals (2019-20 and 2020-21) have been shaved by 20 basis points (100 basis points means 1%) to 7.3 percent. According to the Asian Development Bank (ADB), India's projected GDP growth of over 7% for the current fiscal. Fitch Ratings Inc. is one of the big three credit rating agencies (other two -Moody's and Standard & Poor's). It is one of the three nationally recognized statistical rating organizations (NRSRO) designated by the U.S. Securities and Exchange Commission in 1975. Fitch Ratings is dual-headquartered in New York (US) and London (UK). Renowned filmmaker Kalpana Lajmi (64-years) passed away at the Kokilaben Dhirubhai Ambani Hospital in Mumbai. She was known for her women-oriented films like ‘Rudaali’, ‘Daman’, ‘Darmiyaan’. Lajmi was suffering from a chronic kidney disease and liver failure. Lajmi's last movie as a director was "Chingaari" in 2006, based on a novel "The Prostitute and the Postman" by Bhupen Hazarika, who was her partner. According to the Film Federation of India (FFI), Assamese film ‘Village Rockstars’ is India’s official entry for Oscars 2019 in the Best Foreign Language film category. Village Rockstars is the story of a young girl Dhunu (10-years) who wants to be a guitarist. Village Rockstars is only the second Assamese film to win the Swarna Kamal for Best Feature Film at the National Film Awards, after Jahnu Barua’s 1987 film Halodhia Choraye Baodhan Khai. For the 2018 Oscars, Rajkummar Rao and Pankaj Tripathi starrer ‘Newton’ had been pitched for the top honor. Indian filmmaker Rima Das is the Director of the film, Village Rockstars (2017). The 91st Academy Awards is scheduled to be held on 24th February 2019. The Lucknow Metro Rail Corporation (LMRC) has become the first ever metro rail corporation from India to bag the International 'Royal Society For The Prevention Of Accidents' (RoSPA) Award at a function in Glasgow, UK. LMRC has been given the Silver Award for its Phase 1A (North-South Corridor) in the Project/Infrastructure category for the year 2018. RoSPA is a British charity organization that aims for the promotion of safety and prevention of accidents in project execution worldwide. India's Deepak Punia settled for a silver after losing the 86kg freestyle final to Arif Ozen (Turkey) at the junior world wrestling championship in Slovakia. India ended the championship with seven medals (4- silvers and 3 bronze). Indonesia's Anthony Sinisuka Ginting beat Japan's Kento Momota to take the Men's singles China Open Badminton title in Changzhou. Spain's Carolina Marin beat China's Chen Yufei 21-18, 21-13 to take the women's singles title. Momota (third seed) who took the Japan Open title on home ground last week, was beaten by world number 13 Ginting 23-21, 21-19. Ginting last beat Momota at the Asian Games in Jakarta last month. The men's doubles won by the Danish duo of Kim Astrup and Anders Skaarup Rasmussen. They beat Chinese duo Han Chengkai and Zhou Haodong 21-13, 17-21, 21-14.